The proceeds from the event, which took place during Breast Cancer Awareness Month, will benefit the center’s 42,000-square-foot, $24 million cancer facility. The facility, located on 15 acres in Carterville, Illinois, is scheduled to be completed in December. More than 100 guests attended the event, which was open to the community. Each attendee received a water bottle and a raffle ticket upon arrival. Raffle prizes included an assortment of donated items from our local business community. 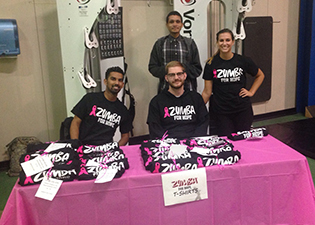 SIU fitness instructors conducted Zumba sessions throughout the night to get students and community members dancing in support for the cause. The Business Leadership Council’s president, Briana McAdory, a junior studying marketing along with Blake Bussie, a junior studying marketing and the vice president of the organization, led the BLC in conducting the successful event. The Zumba for Hope event allowed BLC members to develop business skills such as leadership, marketing and professionalism. Bussie said that collaboration with the SIU recreational center, in addition to being on WSIL-TV’s morning news program, sending various emails and working closely with the sponsors, gave members the opportunity to interact with businesses in a professional manner. (WSIL-TV is the ABC-affiliated television station located in Carterville). BLC advisor Jill Gebke also helped the group make connections throughout the College of Business. With the help of faculty and staff of the college, BLC members were able to promote the event, receive business strategy advice and raise money for the new cancer center, McAdory said. Charles Robinson, a senior studying marketing and the BLC’s vice president of programming, helped partner with all 30 sponsors for the event. The sponsors were responsible for donating prizes for the raffle and helped promote Zumba for Hope. The organization’s members used different marketing strategies they have learned in the classroom to promote the event. They set up marketing tables around campus, sold Zumba for Hope T-shirts, posted fliers, promoted the event through social media and even had the opportunity to talk about the event on television. “I am so proud of the Business Leadership Council and all that we have accomplished,” Bussie said.